From Australia's best-selling female author, Sally Rippin, comes Polly and Buster - a brand new junior fiction series about the magic of friendship. Who ever heard of a witch and a monster being friends? Everyone knows that witches don't mix with monsters. Witches are educated, c... read full description below. From Australia's best-selling female author, Sally Rippin, comes Polly and Buster - a brand new junior fiction series about the magic of friendship. Who ever heard of a witch and a monster being friends? Everyone knows that witches don't mix with monsters. Witches are educated, clever, sophisticated. But monsters? Monsters are just uncouth. Some are even dangerous. But Polly the witch and Buster the feelings monster have been best friends forever. It's the sort of friendship that makes your heart squeeze with happiness. Somehow, they've managed to keep their friendship a secret. Until one day, when everything changes ...Sally Rippin is the author of over 50 books for young readers, including the best-selling Billie B Brown early reader series, and its recent spin-offs, A Billie B Mystery, Billie's Adventures and the Hey Jack! series. 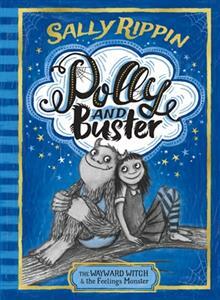 Her new series Polly and Buster is accompanied by her own enchanting illustrations.